Spangler Candy, located in Bryan, Ohio, is home to many of America’s favorite candy. 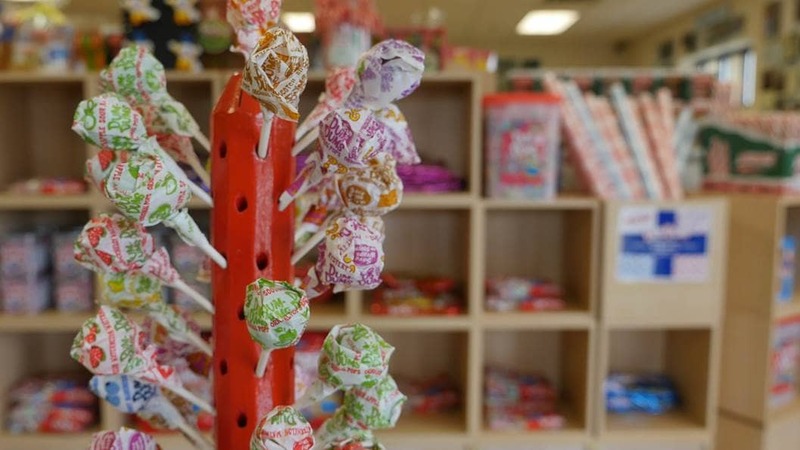 Since 1906, this family-owned company has been making lollipops, candy canes and marshmallow candies. They manufacture nearly 12 million Dum Dums® per day, one of its most recognized brands. In September of 2018, Spangler Candy announced the acquisition of Necco wafers and Sweethearts brands. All of its candy is distributed throughout the United States and to many international countries. Tours of the facility offer visitors an opportunity to learn how the candy is made and packaged. Food safety is a top priority at Spangler Candy. The food processing industry demands that manufacturers take every precaution to provide a safe environment and follow recommendations to reduce the risk of a devastating food safety event. As the most important issue any food company faces, incidents are largely avoidable if proper design and construction materials are in place. Spangler Candy has continued to work with FiberTite because it is a product and relationship it can trust. Since the initial installation, the company has installed over 300,000 additional square feet of FiberTite roofing. Spangler Candy has trusted FiberTite for 18-plus years. The roof is resistant to the tacky exhaust from the candy manufacturing process, as well as UV exposure in the summer and sub-zero temperatures in the winter. Most importantly, the FiberTite Roofing System ensures a safe, leak-free environment for its food processing plant. Seaman Corporation, manufacturer of FiberTite Roofing Systems, has been a worldwide market leader of innovative, high-performance coated fabrics since 1949. Using a unique, four-layer technology providing puncture, UV, chemical and ponding water resistance, FiberTite is the original Elvaloy KEE membrane with a 35-plus year history of performance. Seaman Corporation has manufacturing locations in Wooster, Ohio, and Bristol, Tennessee. In addition to FiberTite, Seaman Corporation also makes fabrics for more specialized markets, including military, dock seals, marine applications, pool covers, truck tarps, mower covers and others.